This is god's eye. 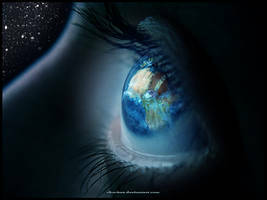 Earth is god's eye, and he is watching upon our future, in this big universe. Can Someone Please Give Me This Picture On 1920x1080 Resolution ? Wow, I did a painting with a similar idea to this once. "Wow! That is truly brilliant! I love it!" This looks really pretty! Pls check out my feed! what did you use to edit this? So beautiful and ethereal, I think I may faint. I'm so charmed by this picture. It's...breath-taking...beyond words. is having a Creative Eye Contest! Hope you stop by and check it out!! You can read all about it in our journal blog! I would like to invite you to Please stop by and if you like it, please join! This is so amazing and gorgeous. I totally get this "emotional" feeling from it. i cant download it...why? it keeps me showing a new window/browser. but anyway i love it!!! The eye of god. A rather fitting name for such an excellent piece of work! The lighting on the eye highlights the earth and shows the main focus point. Thanks for the comment. I'm glad you like it that much. I really like this, several years ago I used this as my wallpaper for a month, and I'm really picky about my wallpaper. I am a deviant now so I'm fav-ing it. I'm glad you like it that much. What I like about this piece is how you make the image of God seem soft and so ethereal, and yet so solidly there that you really can't deny His existence. Wonderfully done (and yes, most of us do pay attention to detail. And I actually like how you chose Africa to be placed in God's eye, since if you really think about it, that's where creation probably began).